This Cairo-based firm was founded in 2005 by John Matouk and Omar Bassiouny with an emphasis on corporate and M&A, project finance and capital markets alongside its disputes work. Matouk, who heads the disputes group, is a New York-qualified lawyer and US-Egyptian dual national. In 2015, the firm hired partner Amr Abbas from another Egyptian firm, Sharkawy & Sarhan. He previously spent three years at White & Case, where he worked on investor-state and commercial arbitrations, and before that worked at the World Bank in Washington, DC. Abbas has also advised Egypt’s competition authority and had a hand in drafting natural gas legislation. Osman Mowafy is the third partner in the group and heads the litigation practice. The team has experience as counsel in ICSID and ICC cases as well as matters before Egypt’s main arbitral institution, the Cairo Regional Centre for International Commercial Arbitration. Clients in the telecoms sector regularly use the group, including Telecom Italia and the UAE’s Etisalat. It has also advised ArcelorMittal, Spain’s Union Fenosa Gas and hotel chain Melia International, US commodities trader Cargill, and California-based Agilent Technologies. Meanwhile Egyptian contractor Orascom Construction and carmakers Skoda, Mitsubishi, Nissan and Uber are among those that have used it for local litigation matters. It has also defended Uber in a complaint before the European Competition Authority. Matouk Bassiouny paired with Latham & Watkins in 2015 to represent Luxembourg steelmaker ArcelorMittal in a US$600 million ICSID claim against Egypt concerning the construction of a steel plant near the Red Sea. The dispute settled a year later on confidential terms. The firm obtained a US$68 million award for the Emirates International Investment Company in an ICC claim against a major cross-border company, winning costs and legal fees. It is advising the same client in a shareholder dispute with a prominent Egyptian business tycoon relating to control of a major steel company. It won a Cairo Centre award worth 40 million Egyptian pounds for German-owned construction client Bamag MENA in a dispute over a waste-water plant project and then successfully enforced it. There have been other successes for client Middle East Glass in a mediation of a shareholders dispute; and for Cargill in a Cairo Centre case against two Egyptian companies. In the courts, it has helped a Japanese carmaker block claims of US$1 billion by enforcing an arbitration clause, and successfully defended a Swiss Chambers award in favour of client Agilent against an annulment challenge. The firm has been advising Union Fenosa Gas on Egyptian law issues in relation to its US$2 billion dispute with Egypt concerning a natural gas supply agreement. The dispute has given rise to two claims against an Egyptian state entity pending before the Cairo Centre, and an ICSID case against the state. Last year, an ICSID tribunal found in favour of Union Fenosa, awarding the joint venture US$2 billion. Egypt has since applied to annul the award. Matouk Bassiouny is also defending Etisalat Misr in a US$36 million Cairo Centre arbitration filed by Vodafone Egypt. The dispute relates to an interconnection agreement and regulatory administrative decisions by the telecoms regulator. The firm obtained a US$6 million award plus interest and arbitration costs for Emirates International Investment Company in a case against a prominent Egyptian business tycoon. It had another good result for EIIC in an ICC dispute worth over US$68 million against a major cross-border company. The firm also helped a multinational steel manufacturing corporation amicably settle a US$600 million investment dispute against Egypt. In early 2018, the firm hired partner Menha Samy, a former legal counsel for the Middle East and Africa at French fashion company Chanel. The firm also made a number of new hires at associate level. Mohamed Shehata, general counsel at Etisalat Misr, which is using the firm for two complex arbitrations, praises the team’s ability to prepare for cross examination, which he says is not found in other firms in the jurisdiction. He describes Amr Abbas as a “sharp lawyer” with “impressive advocacy skills”. He calls senior associates Ahmed Abdel Hakeem and Mohamed Sallam “rising stars”. Another client who wishes to remain nameless says that when it comes to disputes work, she would not consider using any other firm in Egypt. Matouk Bassiouny & Hennawy’s Dispute Resolution Group has maintained a dominant position in the Egyptian market based on its successful representation of multinational clients in high value cases. The Dispute Resolution Group’s primary goal is to effectively manage risk and resolve disputes pursuant to clients’ strategic interests – whether through amicable negotiation, litigation or arbitration. 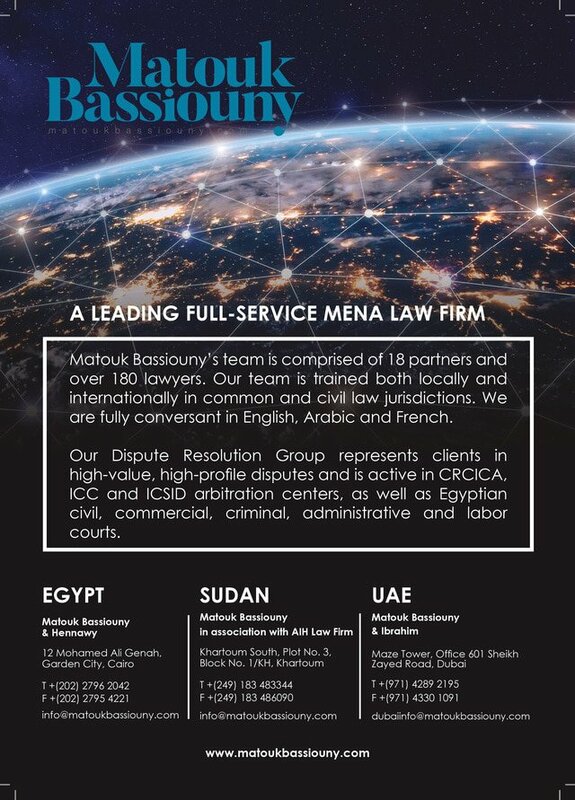 Comprised of four partners and over 50 attorneys trained in both common and civil law jurisdictions with high standing in regional and international levels, Matouk Bassiouny & Hennawy’s Dispute Resolution Group provides clients with comprehensive dispute resolution services in both English and Arabic. The Dispute Resolution Group specializes in arbitration cases held before international and regional arbitral institutions including, the Cairo Regional Centre for International Commercial Arbitration (CRCICA), the International Chamber of Commerce (ICC) and the International Centre for the Settlement of Investment Disputes (ICSID), as well as Egyptian civil, commercial, criminal, administrative and labor courts.